When you set the Command property of a user interface element, you’re binding that element to a particular command. 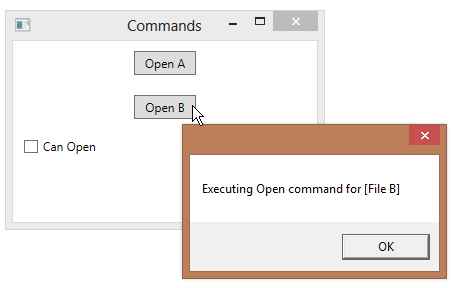 The command, in turn, is associated with some code through its Executed property. You can specify a command parameter using the CommandParameter property. The data in this property will be passed to the code that runs when the command executes. The XAML fragment below shows two buttons that both bind to the same command, but pass in different data. We can then read that parameter in the code bound to the command’s Executed property.